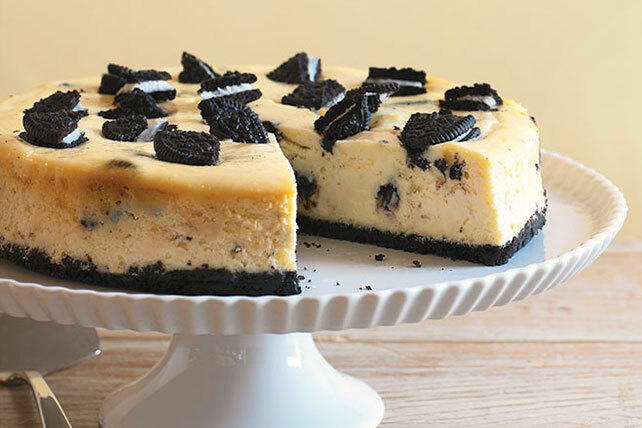 Enjoy a fabulous cookie-laced cheesecake with this Easy OREO Cheesecake! You'll wow the whole party with this deliciously Easy OREO Cheesecake. Place 28 cookies in resealable plastic bag. Flatten bag to remove excess air, then seal bag. Finely crush cookies by rolling a rolling pin across the bag. Place crumbs in bowl. Add butter; mix well. Press onto bottom of 9-inch springform pan. Beat cream cheese, sugar and vanilla in large bowl with mixer until blended. Add sour cream; mix well. Add eggs, 1 at a time, beating after each just until blended. Chop or crush remaining cookies. Gently stir 1-1/2 cups of the chopped cookies into batter. Pour over crust; sprinkle with remaining chopped cookies. Bake 1 hour 10 min. or until center is almost set. Run knife around rim of pan to loosen cake; cool before removing rim. Refrigerate 4 hours. Save 70 calories and 9g of fat per serving by preparing with Reduced Fat OREO Cookies, PHILADELPHIA Neufchatel Cheese and BREAKSTONE'S Reduced Fat or KNUDSEN Light Sour Cream.